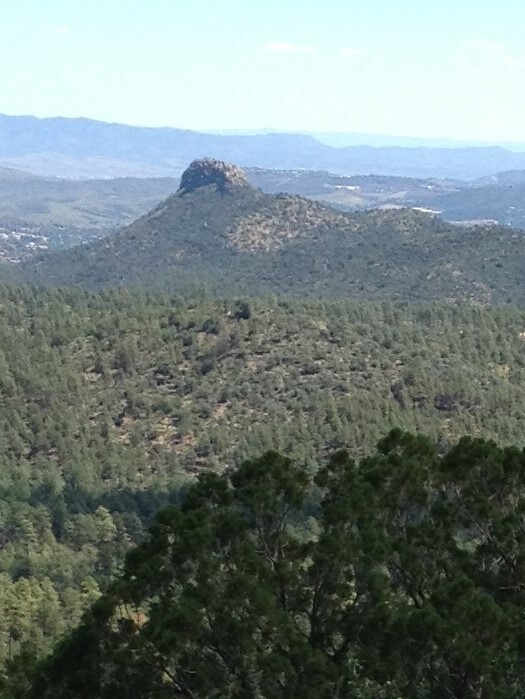 Springtime is hikin’ time in Prescott, AZ. The weather is finally warming up and I’m seeing more people on the trails. Recently, I headed to Thumb Butte to hike a new trail. You are probably aware of the loop trail that goes to the top of Thumb Butte, but did you know there are lots of trails on the north side of the road? Even if you’ve hiked some of these trails before, you might want to check them out again. The Greater Prescott Trail Planning group has added some new trails in that area. 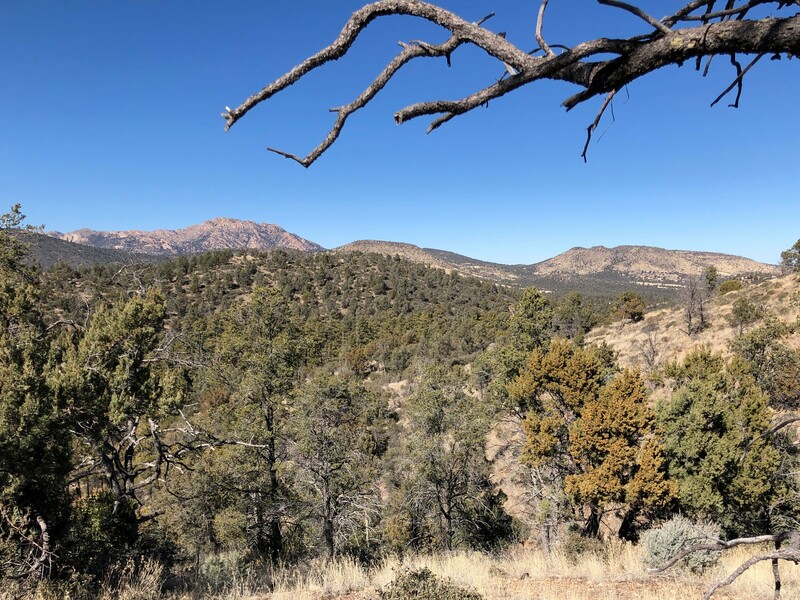 With help from the “Over the Hill Gang,” Prescott National Forest improved some of the social trails, making them full-fledged hiking and biking trails. One of those is the Piglet (trail 328). That was the trail I was heading for that day. I wasn’t sure how the trail got its name until a family of javalina ran across the road in front of my car. I decided the trail was named for those pig-like animals that inhabit the area. Once you reach the Thumb Butte picnic area and pay the $5 fee (It’s free on Wednesday), park near the host campsite. To reach trail 328, you will need to begin on 315. The trailhead is just to the left of the host. From 315, you will go on trail 317 for a short distance before reaching a gate that goes to some houses. Turn left at the gate, and you will be on trail 328. You will be treated to amazing views of the San Francisco Peaks, and Granite Mountain, as well as Little Granite Mountain. Trail 328 ends at the 316. Go left onto 316 and it will return you to the parking lot. If you would like a longer hike, turn right on 316. There are plenty of pines and a little creek to cross. When you reach the 317, turn left to go back to the parking lot. Enjoy the views of Thumb Butte along the way. 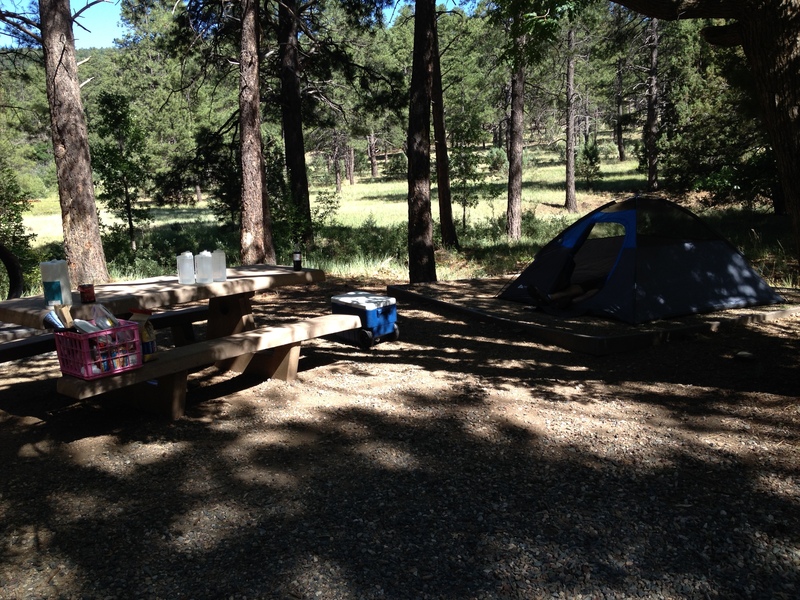 Summer Hiking in Prescott National Forest–NO SWEAT! Craig and I usually take a little hiatus from hiking during July and August, but this year we decided to give it a try. Last Wednesday, we loaded up our camping gear and headed for Potato Patch Campground at the summit of Mingus Mountain. The next morning we tackled the Woodchute Trail. Because the trail is in a wilderness area, we signed the register. After checking out warnings about bears and mountain lions, we opened the gate and passed through. The first part of the trail is through cool, shady pines–very enjoyable in the early morning. But soon we found ourselves hiking under the warm sun along a ridge. Far below we could see and hear cars on Highway 89-A. Reaching a saddle, we were treated to a double view. Looking east, we could see the picturesque Verde Valley stretching out toward the Mogollon Rim. Turning to the west, there was the sprawling Lonesome Valley. It was easy to pick out the green sections that are Prescott Valley. Beyond that, we could see Granite Mountain and even Thumb Butte. At the bottom of the trail, we re-entered the pines until we reached an area known as Rick’s Tank. Continuing on Trail 102, we made the steepest climb of our hike until we were on another saddle. Crossing the saddle, we came to a fork. The 102 continued to the left, but we took the trail to the right. Our trail soon came to an end on a steep cliff. The view from that point was the most spectacular of the day. There at the north end of the Verde Valley we could see Clarkdale and Sycamore Canyon and even the San Francisco Peaks. It was there that we ate our lunch, taking in the view and listening to the whistle of the Verde Canyon train. The temperature that day was eight-five degrees, which wasn’t too unbearable. Our hike was eight or nine miles round trip, which was not too exhausting. 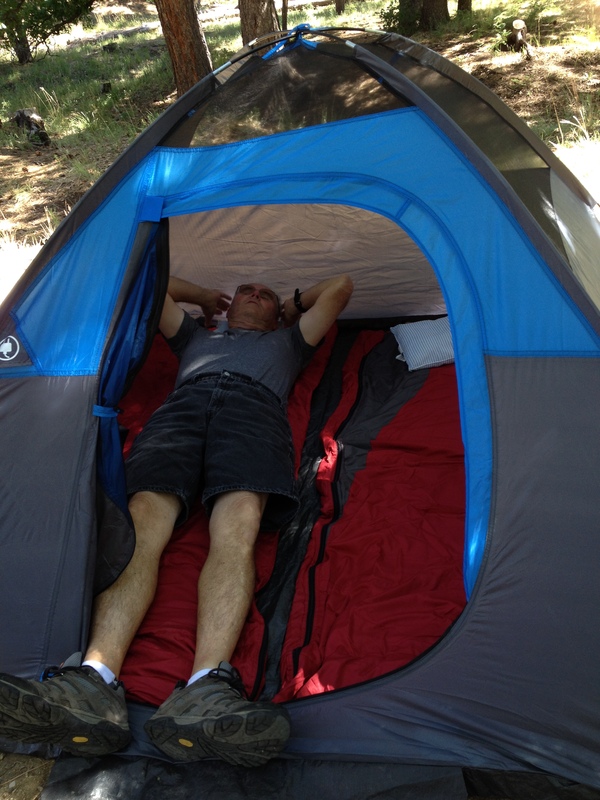 We were certainly grateful for the shade when we found it and glad to get back to our campsite for some rest. When it comes to summer hiking, I would recommend Mingus Mountain as an excellent choice. There are lots of trails to choose from and many with much more shade than the Woodchute. The Butterfly trail is one of my favorites. The trailhead is also at the summit, on the east side of Highway 89-A. Take the dirt road for about a mile. At a hairpin turn, you will find the trail begins on the left side of the road just beyond an old concrete dam. It is a short, easy loop through the cool pines. Hopefully we will get in a few more summer hikes before September when we will begin the challenge of Hiking Spree 2016.